DNO ASA, the Norwegian oil and gas operator, today announced that a fourth well has been put on production at the Peshkabir field in the Kurdistan region of Iraq pushing total output past the previously published target of 30,000 barrels of oil per day (bopd). The Peshkabir-5 well is currently producing around 8,000 bopd from three Cretaceous and two Jurassic zones through temporary test facilities and the oil trucked to Fish Khabur for export. Seven Cretaceous zones and two Jurassic zones were flow tested, with individual zones ranging between 3,600 bopd and 7,200 bopd. 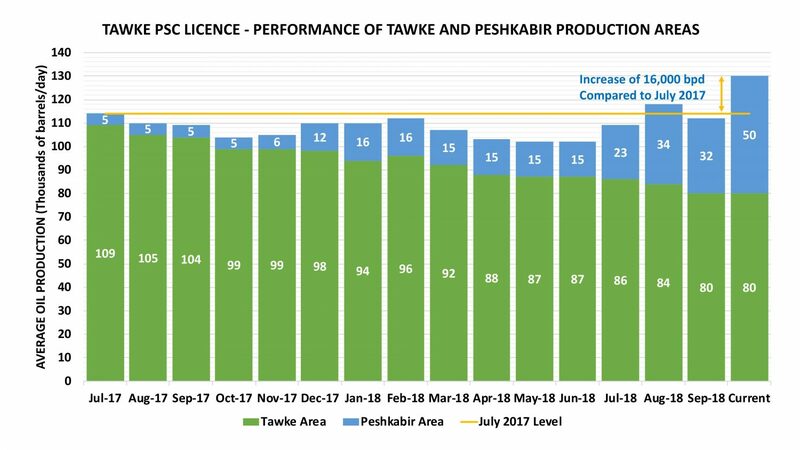 “At around 35,000 bopd, Peshkabir has now leapfrogged into second place after Tawke among the Kurdistan fields operated by the international oil companies,” said Bijan Mossavar-Rahmani, DNO’s Executive Chairman. “We are setting our sights on higher production and accelerating field development,” he added. The Peshkabir-5 well was designed to appraise the western extension of the field and drilled to a measured depth of 2,918 meters in 57 days at a cost of USD 12.1 million. Two other wells, Peshkabir-6 and Peshkabir-7, have now reached target depth of 4,250 meters and 3,750 meters, respectively, and will commence production testing in August. The Peshkabir field was brought on production in 2017 and the two drilled wells last year, Peshkabir-2 and Peshkabir-3, have produced at a constant combined rate of around 15,000 bopd. The Peshkabir-4 well, completed in July, is currently producing around 12,000 bopd. DNO operates and has a 75 percent interest in the Tawke license, which contains the Tawke and Peshkabir fields, with partner Genel Energy plc holding the remainder. Posted in Construction & Engineering In Iraq, DNO, featured, Genel Energy, Iraq Oil Production News, Kurdistan News, Norway, Peshkabir.